School is an important part of your child's life, from the first day of kindergarten to that final graduation date, whether it be high school, university or graduate school. Find out how to get your child ready for this very important time in his life, a time that will help to shape him into the person he will one day become. 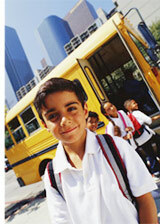 Read up on information pertaining to your child's school life. Learn about what tutoring techniques work for kids, whether you're sharing the information with your child's tutor or whether you're using it yourself as you sit down and help your kids with homework. Get information on active reading. Cultivating active reading habits in your child will benefit him throughout his school life. Not evey child has it easy in school. Math is one area that many children have problems with. Building Math Skills: Ages 6 - 8 will give you tips on things you can do at home to imporve your child's ability in math. For some children, though, a learning disability can cause them a lot of frustration at school. Types of Learning Disabilities will give you a better idea of the the different learning disabilities out there while Children with Learning Disabilities: Parenting Advice will give you some useful tips on how to help your child be successful. A common learning disability, dyslexia can make school very frustrating for your child. Being able to recognize the symptoms early, though, can allow you to understand better just what the most effective teaching methods are for your child. By adjusting your child's learning style, your child will be able to succeed in spite of her dyslexia.